I have been working in bone china since 1991 using traditional slip casting techniques: designing my own models, making plaster moulds, then slipcasting very thin translucent pieces. 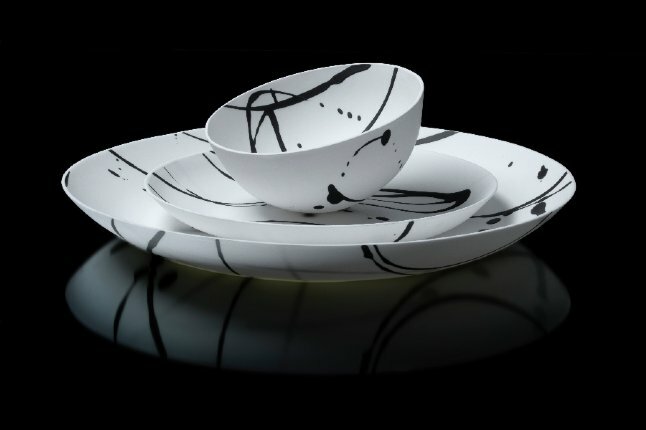 Conventional forms, vessels, bowls and plates retain both their functional identity but also serve as a natural canvas for decoration. Depending on the decoration each series has its own identity. 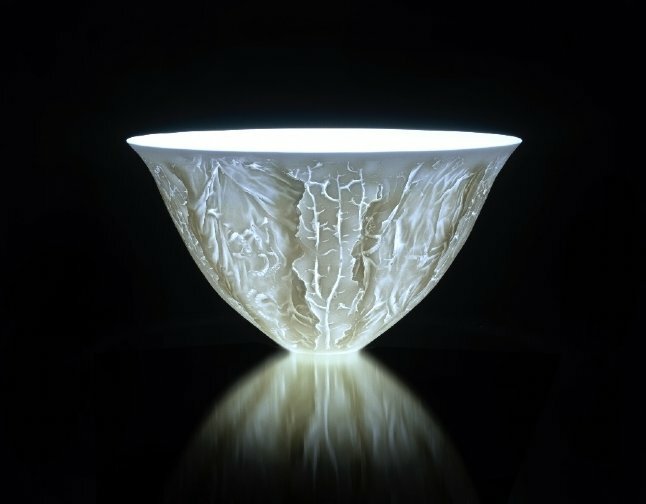 I am captivated both by the smooth matt white surface of bone china and it’s translucency. Incorporating paperclay textures allows light to pass through thin areas of line and texture adding an extra dimension to the work that is sometimes unpredictable. 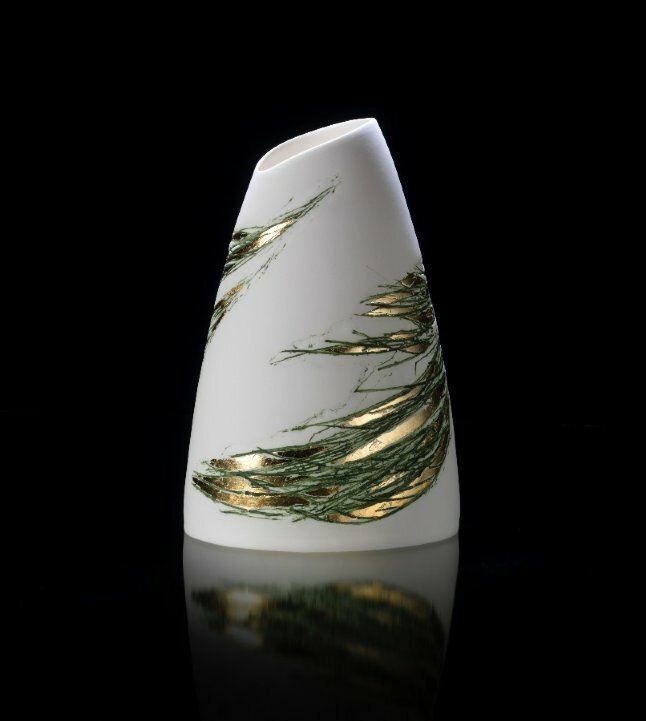 My work develops in series mostly inspired by nature: swirling organic paperclay textures follow the shape of the vessel, inviting the eye around the piece to explore the other side, as can be seen in ‘Spindrift’ and the ‘Green and Gold Spray’ series. I have recently developed a looser approach to decorate. This can be seen in ‘Symphony in Black and White’ where black slip dances around “rocking” bowls and over and under forms. 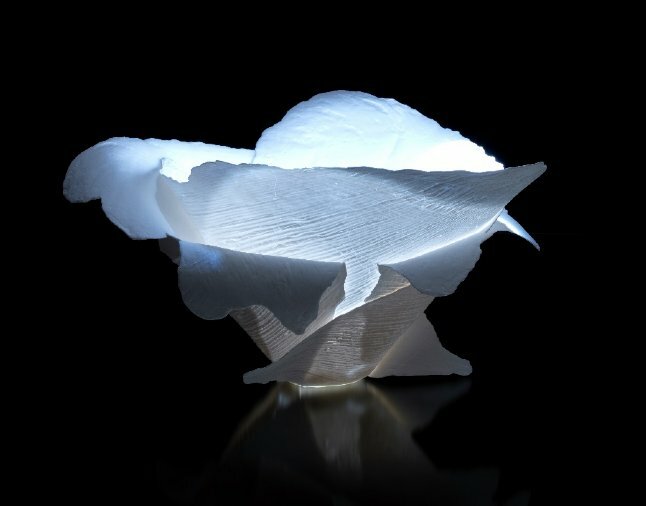 Alongside these decorative pieces I have been developing translucent freestanding sculptural works. These ceramic sculptures create tension and flow, allowing more contrast of light and dark, emphasizing pattern produced by overlapping paperclay textures.